HIROSHIMA - Rika Kihira made a great first impression on a great many people with her performance at the NHK Trophy last weekend. 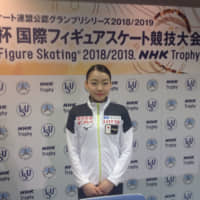 The 16-year-old was nothing short of spectacular in her senior Grand Prix debut, beating a veteran field that included teammates Satoko Miyahara and Mai Mihara, as well as former world champion Elizaveta Tuktamysheva. 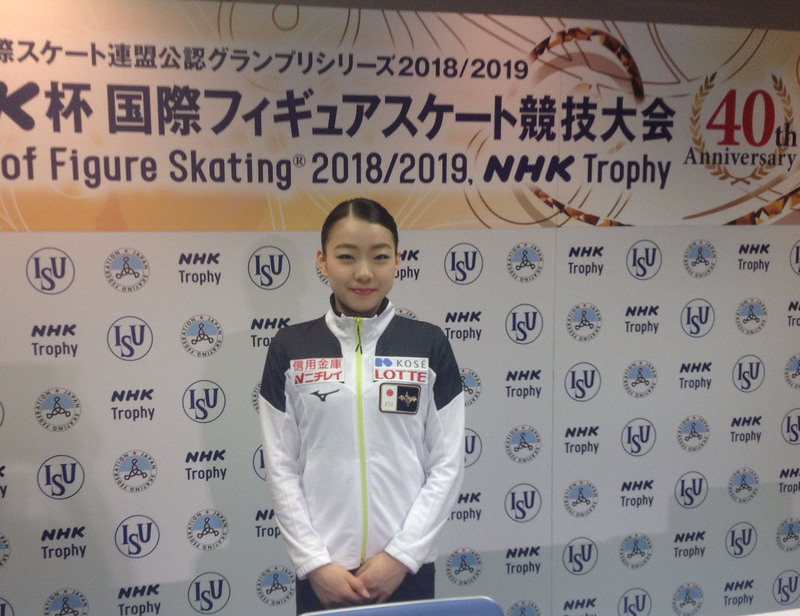 Kihira, Japan’s junior champion last season, rode her triple axel to victory before the home crowd and almost certainly a place in next month’s Grand Prix Final. It wasn’t just Kihira’s jumps that resonated with the crowd and the experts, but the total package she presented. She skated with panache and her program components were truly wonderful as she racked up a winning total of 224.31 points. Eurosport’s Simon Reed liked what he saw of the young star. Despite a fall on her triple axel in the short program, Reed’s broadcast partner Chris Howarth was moved by Kihira’s poise. Kihira’s stunned the veteran observers with her free skate to “Beautiful Storm,” which began with her landing two triple axels in the first minute. Four-time world champion and CBC analyst Kurt Browning made it clear he was watching something special. Browning cited Kihira’s ability to get the most out of her physical effort. Browning also sounded a cautionary note in his analysis. Browning’s fellow analyst Carol Lane was concise with her view of Kihira. Kihira is already plotting ways to boost her scores. Satoko Miyahara (219.47) took second place behind Kihira with another sublime pair of programs. Miyahara’s jumps were clean during her short program to “Song for the Little Sparrow,” where she was second behind Russia’s Tuktamysheva. Howarth noted Miyahara’s rotational velocity, something Ice Time has written about in the past. “It was a huge skate. I don’t think I have ever seen anybody rotate as quick as her,” Howarth stated. “I would love to know how fast she rotates. She has got to be in the mid-300s of rpms. It’s incredible. Miyahara’s free skate to “Invierno Porteno” had some technical issues, with a pair of under-rotations and edge calls, but so enchanting is her skating that it seems almost secondary. Howarth admired Miyahara’s mettle while under pressure. “She deserves some extra points just for the mental strength, doesn’t she, to come out and do that at the end of the competition,” Howarth commented. Mai Mihara, who was third after the short program, had to settle for fourth with a total score of 204.20, which would have won Skate Canada and been second at the Helsinki Grand Prix. It was just a case of bad luck for Mihara to have been part of such a loaded field. Her beauty and elegance were on full display in both programs. Reed likes Mihara’s potential going forward. Howarth was amazed by the speed on the rotation of Mihara’s jumps. Browning, a legend in his own right, had the highest praise for Japan’s skaters as a group. “If I could describe all of the Japanese skaters, it’s that they have an honesty about their skating, a purity,” Browning stated. Shoma Uno’s victory in the men’s competition was almost an afterthought after the stunning show in the women’s event. Uno (276.45) easily won the title over Russia’s Sergei Voronov (254.28) and clinched a spot in the GP Final. The Olympic and world silver medalist over-rotated his quad toe loop and fell in his short program to “Stairway to Heaven” but still had the lead going into the free skate. Howarth cited Uno’s physical gifts and ability to save a jump. Two-time Olympic champion Yuzuru Hanyu, who won the Helsinki GP two weeks ago with record scores, will look to join Uno in the GP Final with a podium finish at the Cup of Russia. Hanyu, who will compete in Russia along with compatriot Kazuki Tomono, will vie for the title with the host nation’s Mikhail Kolyada and Canada’s Keegan Messing. Mako Yamashita, who was second at Skate Canada in her senior GP debut, will try to clinch a spot in the GP Final in Moscow where Olympic champion Alina Zagitova will be an overwhelming favorite. Yuna Shiraiwa and Yura Matsuda will also be in the field. Shiraiwa was named as a replacement for Wakaba Higuchi, who had to withdraw last week due to an injury to her right foot.